A state Department of Health employee described as a "disgruntled worker" shot two of his Jacksonville supervisors then turned the gun on himself at a Riverside Avenue office building yesterday morning, police said. Philip Thoma, 43, and Don Steiner, 50, were shot at least two times each at their office building at 1045 Riverside Ave., said Frank Mackesy, director of operations with the Jacksonville Sheriff's Office. Both were taken to Shands Jacksonville and listed in critical condition yesterday afternoon. Wayne L. Horowitz, 52, was found dead inside the building shortly after 9 a.m., from a self-inflicted gunshot wound, police said. Some of Horowitz's neighbors in his Orange Park subdivision described him as friendly and outgoing and expressed shock that he was involved. But Mackesy said Horowitz "was unhappy and felt like people working with him didn't like him." The three men were among 15 employees of the Department of Health's Radiation Control Division, a regulatory division that checks X-ray machines and other radiological equipment used at Northeast Florida hospitals. Horowitz entered the division's second-floor office and told Steiner that he wanted to talk with Thoma. He had a seat in Thoma's office, then shot him multiple times, Mackesy said. "He didn't say anything, he just stood up and shot him," Mackesy said. As Horowitz was leaving Thoma's office he ran into Steiner and shot him also, before turning the gun on himself, Mackesy said. Sheriff Nat Glover said three officers responded to the multiple shooting about 8:55 a.m.
Scott Chomic, who works at 1000 Riverside Drive, said two women were upset when they came running into his office and told him two people had been shot. Jeff Goldhagen, director of the Duval County Health Department said representatives from the state Department of Health were closing the office at least through the weekend. "Everybody is devastated," Goldhagen said. Grief counselors with the American Red Cross of Northeast Florida and the health department were at the scene meeting with employees, who Goldhagen said will be on administrative leave until the office reopens. About 150 people in the area were receiving help, said Christian Smith, spokeswoman with the Red Cross. John Agwunobi, secretary of the Florida Department of Health, declined to discuss the case except to extend support and concern to all the families involved. Horowitz's family declined to comment. In the neighborhood where Horowitz lived, 15 miles from the Riverside office, friends and neighbors described him as happily married and outgoing and said they had never seen him angry. Even as the word "seemed" crept into their descriptions of Horowitz, they said it was impossible to imagine, even in retrospect, that he would have opened fire on others or take his own life. "He seemed to have the perfect marriage; It seemed like they had everything going in the right direction," said Chris Williams, who lived next door to Horowitz. "He was very friendly, very nice. I wouldn't even imagine him having a gun." Horowitz lived with his wife, Linda, in a single-story brick house with a fresh-clipped lawn on the 200 block of Vanderford Road West. Property records show they purchased the home in 1987. The couple had four children, all grown, and seven grandchildren, whom neighbors said Horowitz often talked about. Horowitz took his job with the state agency after retiring from the Navy in the early 1990s. He also opened a photo studio in his home, fulfilling a life-long dream, according to a biography posted on the studio's Web site. Family members of Thoma and Steiner were at Shands yesterday afternoon and requested that they not be bothered by the media. Staff writers Binyamin Appelbaum, Matt Galnor, Tia Mitchell, Dana Treen and Greg Walsh contributed to this report. 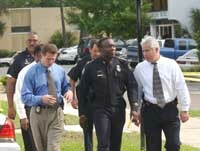 Staff writer Veronica Chapin can be reached at (904) 359-4161 or vchapin jacksonville.com.